The Triumph of Death is a fresco 600x642 cm large, hanging in the regional Galleria Abatellis Palace in Palermo. Originally it stood in the courtyard of Palazzo Sclafani, a fourteenth century building transformed, in the mid fifteenth century, after the transfer of the Sclafani family in Spain, the seat of the big and new Hospital of Palermo. Removed in 1944, for the war damage, the painting was sent to Abatellis Palace when the gallery was opened. In addition to being a masterpiece on the subject, it is the most representative in the term of "internationalism" in Sicily, which culminated in the reigns of Ferdinand I in 1412 and Alfonso of Aragon in 1416. The author's name is unknown, it is referred to as the Master of the Triumph of Death and the date goes back to 1446 or so. 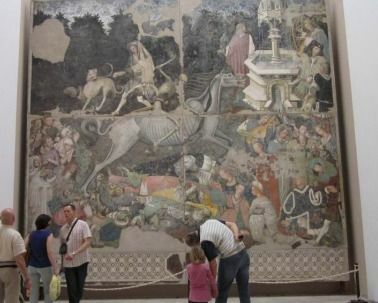 It is thought that the Triumph of Death fresco is the result of a precise royal commission, perhaps a foreign artist, Catalan or from Provence, called in this regard in Sicily. Probably this was a commission by the rectors of the hospital, and the theme is certainly due to the vanity of earthly goods. The artist is clearly expert of figurative art of late gothic style, with references to various models ranging from miniature tapestry, painting Catalan and the Franco-Burgundian. The theme of the Triumph of Death was widespread in the fourteenth century, but here is a particularly intense representation and also obsessive on macabre and grotesque themes, rare feature in Italy, which is why the author must be from out of Italy. The scene, seemingly surreal but with strong hooks to reality, is eloquent: death on the back of a horse skeleton comes into a garden and hurls his darts on noble young girls and carefree; below her there are the virtues of the world: bishops, a pope, an emperor, a sultan, a man of law. 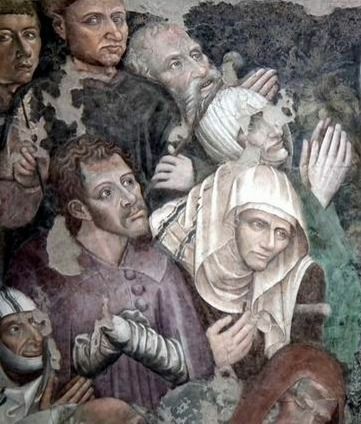 Death has spared only the crowd of the poor humble invoking it instead as a liberation from earthly suffering, similar to what is shown in the Triumph of the Cemetery at Pisa, by Francesco Traini the '300. 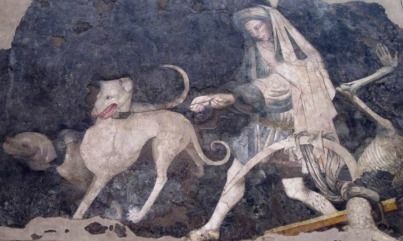 On the right, in the second floor, a fountain, a symbol of life and grace, and on the left a man with two dogs, probably referring to San Vito, holy healer characterized by the company of a couple of dogs. In the two characters in the middle of the ragged, the painter and his assistant are recognizable: they are holding the jar of colors. Despite the complexity and richness of the subject, the scene is composed in a compact and uniform style, thanks to the linear feature and to the abundant brush strokes that give consistency to the color. Visit the Triumph of Death. 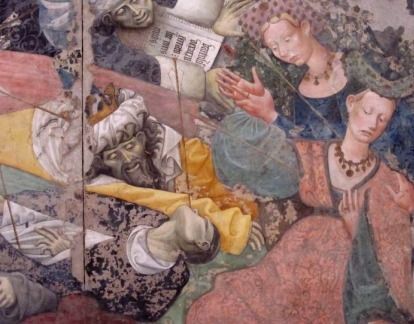 The fresco is included in our walking tour or by car or minivan with driver/guide.